Kampong used to be a gem of Singapore’s history and an undeniable fact of our rich culture. It was an amazing place for ones to experience the traditional Malay culture and custom. However, modernization has since crept in, gingerly substituted the serene with the hard concrete and buzzing traffic, leaving behind the nostalgia for many to search for their childhood happiness and reminiscence the hospitality of the warm neighborhood…. Years of progression has transformed Geylang Senai from a Malay Kampong into a bustling town, perhaps the only scene that seems to be familiar is none other than our Malay friends hastening through each other, the baju kurung, baju melayu shops and the air that fill with the aroma of the satay, mee rebus, nasi padang…..
Haig Road Food Centre is located at the heart of the Geylang Senai, a place where Hari Raya light up and a must visit place for good Malay foods. For a foodie’s family and my wife’s connection with the Peranakan Chinese and Baba-Nyonya background, it is natural we build up our soft spot for the Malay food and make us frequent patrons here. 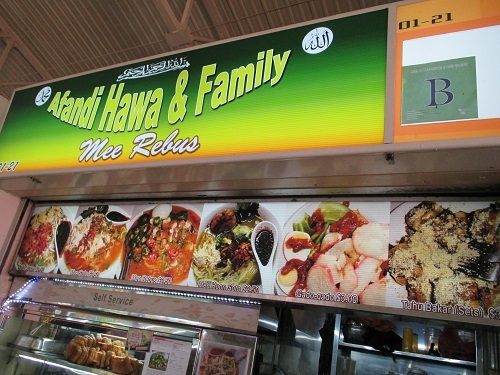 There are two food centres in Geylang Senai, besides the Geylang Senai Food Centre and the sister – nearby Haig Road Market and Food Centre features another perspective of our Malay food. Over here, you will be spoiled with choice for Malay food, from the famous Satay, our favourite mee rebus, kueh tutu to the nasi padang, this is a place that you can find many of the authentic Malay tradition taste and indulge yourself for the splendid salivating temptation. 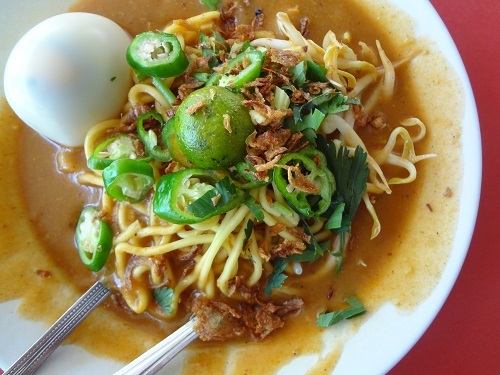 The mee rebus has always our top favorite here even above the famous satay stalls here. 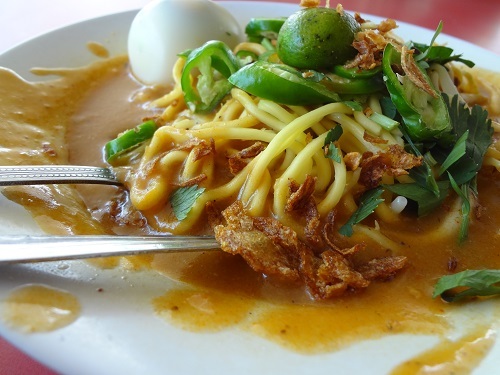 The rich and aromatic gravy created a beautifully subtle of sweet and savory flavours that made every taste bud came lively instantly, you can taste the seafood flavour muddled up with all other ingredients in the gravy, complement the yellow noodles well and created a truly tantalizing Malay delicacy. We complete the meal with the famous kueh tutu, followed by taking a stroll around the “Kampong” with a satisfying stomach was simply enjoying.